Violet is our main focus this week! We spent three days with her! She is trying to establish a testimony in God calling a prophet to restore Christ's church on the earth. We taught her about the Book of Mormon on Wednesday and bore testimony of it's truth and receiving answers through studying it. So right now she is reading the Book of Mormon! We met with her on Friday, before her mom picked her up for the weekend at home. She was really nervous when we saw her on Monday. She told us her Mom doesn't favor religion much and especially doesn't like the Mormon church because of what she's seen on TV. We talked about the priesthood and blessings. She desired to have one, so on Friday we met to have a member of the branch give her the blessing. It was so incredible! He explained about the priesthood and how blessings come to pass by our faith in Christ. He was the best guy to give her this blessing! He got to know her a little bit and after the blessing asked her why she is meeting with us. She said (from our first lesson with her) that she knows God created her and knows her imperfections and flaws, but still loves her completely. She has definitely felt the spirit working within her. She says the most sincere prayers and said this last time that she loves this church! Guys, she is a miracle. Please pray for her! She is telling her mom this weekend! MLC... Did I mention I've been developing a cold all week? Well it finally hit the day of MLC. I was literally a deaf zombie at the mission home. It was great though. We watched some videos about teaching skills and then discussed the November Zone Conferences. Lunch was so great. We had Hawaiian Haystacks, and then... for dessert, we had Applesauce cake! YUM. We haven't seen Naser all week. He cancelled our last appointment and hasn't been able to meet or come to sports with the branch at all. It's concerning because it's very out of character for him... and it only happened after the elders invited him to be baptized. We are worried he felt it was too pushy... Hopefully he will have more time this week! This week is Stake Conference, so we will get to go tonight and tomorrow to hear messages from the stake presidency and members and President Carlson! ​Spirit-filled week! We had so many great experiences with the spirit this week! First of all, Naser is doing so well! We met with him twice this week. Naser in 31, so he doesn't quite fit in the YSA branch, or so we are told. So we have been working on transitioning him into the family ward. The University elders have been really sensitive to our feelings about this transition. To be honest, we desperately don't want to hand him over, but it is probably what is best for him. We taught him on Tuesday about Jesus Christ. We've covered the other two members of the Godhead already. It is important that we taught him specifically about Christ because he comes from a Muslim background. They believe in Christ a little different, so we established what our beliefs are. He was so accepting. We talked a lot about the Savior's role and how he suffered for us. He had learned about the pre-earth life so that was discussed. He has grown so much in his faith in God. He talks a lot about trusting in Him and how when we are connected to "the source" we are able to be happy. He is searching for eternal happiness. The elders taught the next time about the Atonement specifically. It was so amazing to feel the spirit in both lessons. My love for Naser is indescribable. He is such an amazing son of our Heavenly Father. It is a special gift to watch him grow closer to our Savior and Father. This is the gift of missionary work. Violet is also doing amazing!! 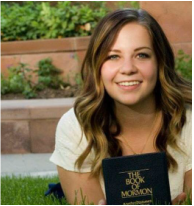 If she isn't the most choice spirit I've met on my mission, I don't know who is. Violet has been prepared beyond belief! We taught her about the Plan of Salvation on Monday. She was able to explain most of it to us as we went along. We talked about Jesus Christ suffering for her so she can return to live with him again. She told us she wants to go to the Celestial Kingdom. The biggest miracle of that lesson was her willingness to pray in front of us. She said the most sincere, heartfelt, personal prayer. She was so nervous but there is no prayer more beautiful. She is like a little child, so willing to learn and try. We saw her again on Thursday. Sierra, a recent convert, came with us! It was incredible! We taught her the Gospel of Jesus Christ. We talked a lot about repentance, baptism and the Holy Ghost. Sierra bore pure simple testimony. The spirit was almost a tangible thing. It was so heavy in the room. I felt like my heart would burst! We invited her to be baptized and to pray about the date she would be ready by. We also talked about her family and the opposition they will pose when she tells them. Please pray that she will be able to stick to her feelings of the spirit as she tells her mom. She is so prepared and just needs to have courage. There is the most important events of the week! I love my companion. We have had some really deep conversations and I just love being a girl and making so many amazing friends. She is simply amazing. We are working hard and keeping the faith! I invite you all to do so as well! 1. 2 Nephi 4:21 - Loves overcomes the natural man. Love qualifies us for salvation through the grace of Jesus Christ. Keep you heads up. Life is hard (as my mom said this week as we chatted) but the grace of Jesus Christ and his Atonement make it possible for us to be better. When life gets harder, look to Christ who is the Savior and Redeemer of your soul. He will bring you through the valleys of life. We are both staying in Bloomington!! Yay! There were some changes to the zone though! We lost our sisters in the Clear Creek ward. :( BUT we also got sisters from China in our branch! So now there are three sets of missionaries in our tiny little YSA branch and on campus! Both of these sisters are from China. One has been out for 5 months, the other just came from the MTC. It's been a busy week getting them settled in the area! They live less than a mile from us so we help them out a lot. It's so interesting hearing them speak with one another. It will be great for the population of Chinese students at IU. We are excited to get them up and running on campus! On Monday we met this adorable girl named Violet. It was actually a little miracle. We were on campus and I am so happy I was listening to the spirit in that moment. We stopped her and began getting to know her a little. She comes from a non-religious background, but her grandmother is Catholic. She knows very little about God. We conversed about her understanding and asked if we could meet again. She said yes and we set up a time for Friday. Well, a lot happened between those two days. We had district meeting that morning and went to the institute. We had texted her the day before but no response. Usually people don't show up, but we received a text about 20 minutes before the time of the appointment. She said she might be late, but was coming! We had an amazing lesson with her! We discussed God and his role as our Father. We also taught her how to pray. She is very introverted and has some social anxiety, so it was a miracle that she opened up to us. She is sincere and sweet! She said, as we talked about the Holy Ghost, that she felt peace and safety. She said she enjoyed being at the institute building because it feels secure and safe. The spirit was strong!! Stronger than most lessons. We set up another time to meet on Monday. She is so sweet. Please pray for Violet that she will believe her worth as a daughter of God! Naser is doing great! He has been busy, but we got to spend some time with him and some of the members of the branch on Wednesday. He is always willing to come to activities and lessons! Unfortunately, we will be introducing him to the elders of the family ward because he is too old for the branch. It's bittersweet. We are having a hard time deciding when to make the switch, but it will hopefully be the best thing for him. When this happens there is a big risk of losing the investigator, but it can also show their real intent and interest in the church. We hope he is interested enough to hold on through the switch!! I've learned a lot this week. On Monday, we went to a place called McCorrmick's Creek. It's a big state park type of place where we hiked. It was pretty great! And there was some good elevation! We walked near (and sometimes in) the creek water. Each companionship except one in our zone came along. There were a lot of little adventures along the way! We stopped at one point for the elders to attempt to catch crawdads. Not terribly successful, and not enough for dinner! We got to the real part of the hike to Wolf Cave which begins from the creek with a HUGE stair case. It took forever to get to the top! Eventually we got to the top and had about a half mile to the cave. It was less than expected when we reached it. So it's this big rock that has been eroded by water. There's enough space to walk through from one side to the other. Of course we went through! It was pretty terrifying. We didn't bring flashlights, so we were completely in the dark... Let me tell ya, this will be one of those experiences I use in talks in the future!! The biggest miracles of this week are from Naser, our investigator, and Michael, a member we are working with! First of all, we are working with Michael. He is working through a lot of stuff. He trusts us a lot. It's really hard to see those you love suffer. He was able to receive a blessing a few nights ago and I think it touched him. He is so sweet and has a big heart. He can use all the prayers he can get though! Naser is our neighbor. He stopped us and asked if we were Mormons. We said yes and he said he wants to learn more about our church. A friend of a friend of his referred him to our church. So we got his information and invited him to the institute opening social! We walked with him. I think he had a good time! It was a big group of people but he talked to several people! It was great. Due to questions he asked, we discussed our concept of God and how he is our Father in Heaven. It was a concept he didn't know about prior but said he liked it. We gave him a Restoration pamphlet and set an appointment for the following day. He had read some of it! So we taught him some of it and answered questions he had. We invited him to play volleyball with some members and investigators last night. It was great! We are really excited about him! He is so sincere! Pray for him too!! I want to say that I have the best companion! I can't imagine being in Bloomington without her. She is so inspired. All the trials we have gone through this transfer are more bearable because she is amazing. She carries the spirit so strongly! I also know that Heavenly Father has been with us through this transfer and every other day. We are so blessed to have a Father who never leaves our side. We can be strengthened and supported by Him. He loves each of us. And his grace is sufficient for every shortcoming which befall us. The popular verse in John 3:16-17 says it all. Christ came for us, for all the little people to gather around him. God loves you. Christ loves you. And I love you. Time is flying so quickly. I can't believe this transfer is nearly over. Sister Porter and I exclaimed that often throughout this week! On Tuesday we were blessed with the presence and training by President and Sister Carlson. It was amazing. President Carlson talked about a lot of different things regarding the work. There are many changes taking place in the mission and how things are run. He would rather have principles and let the missionaries follow the spirit than to have rules. I love that. The Carlson's are invested and focused on the personal conversion of the missionaries. I've reflected a lot on that. Am I doing missionary things or am I being changed by my mission?? I want to be changed and more converted when I go home. Shout out to Madelin and Ciera for Returning with Honor! President has changed how we record numbers and lessons taught. We have been figuring out what that means this week! It's been a riot! Students have been on campus, but mostly with their parents, so we are waiting until all the parents leave we can actually get to talk to the students! Cool miracle the other day. We were on campus when a man, not a student, stopped us and said "Sisters, can I give you my daughter's number?" We thought, of course, but what is your story? He told us his daughter just moved here for her freshman year. Their family has been on the less active side the past few years but he wants her to get involved with the YSA and institute. He actually has an older daughter at IU too. So we are going to follow up with them today to invite them to church! It was a miracle because we had just barely been on campus when he walked past us and stopped! We met with some recent converts and less active members this week. Calvin finally came back to Btown from Terre Haute. We had a good lesson with him about his conversion story. He is so sweet but still doesn't understand the priesthood and the baptism is a covenant. We are working with him. It's so great that he is back for the semester! Michael is another story. He came to our lesson very distracted and out of it. He brought up some of his big concerns but wasn't in a state of mind to accept anything we were saying. The spirit was definitely impeded. We made a plan to help him over come some of the problems he is having. Prayers for him are much appreciated! He has such a great heart, but gets distracted by the other things that matter less than the basic, bare bones of the gospel. He mostly needs to feel loved and accepted. For the most part we have just been out talking to people. It's been fun being on campus with the new students! We've also gotten a few free things, like ice cream on Thursday! Yum! I know this is true. God loves us so much. He has given us talents and abilities to bless our lives. He works with us when we aren't measuring up. He enables us to be better each day and he forgives our mistakes. We are truly blessed to be children of our Heavenly Father and to know He loves us unconditionally. Have a fabulous week! Don't forget who you are and who made you that way! This week was so amazing! We had a lot of potential to work with! There was so much planned for the week. I spent three days out of our area though. 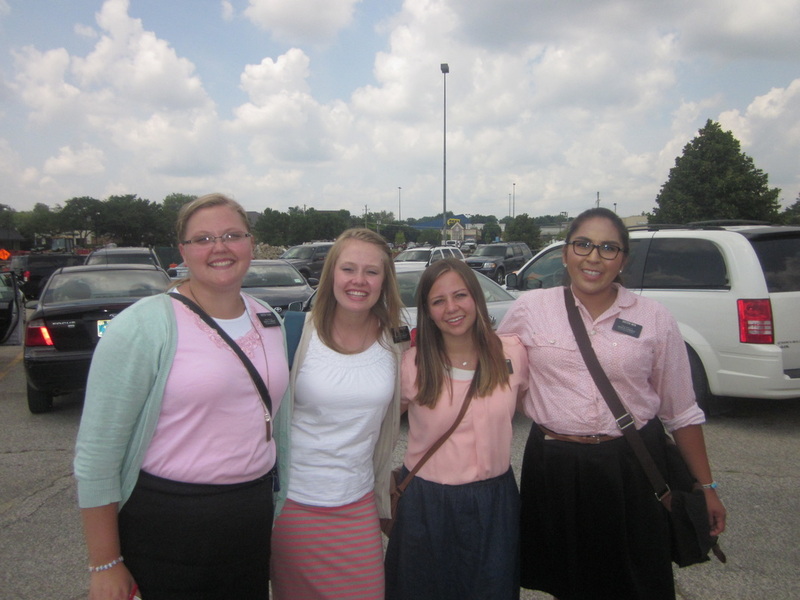 We had exchanges with both sets of sisters in Terre Haute (my love!) and had Mission Leadership Council. It was so great! So MLC was so fun. Funny side story before I get into the spiritual stuff. So we were driving there with the Terre Haute zone leaders. AP Wimmer called us and asked if I would be willing to play the piano for MLC. HAHA! For those of you who don't know, I don't play the piano. I know one song, it's been my missions work! So of course I had to decline. He didn't believe me when I said I didn't play. Sister Porter, being the unified companion that she is, attested to my lack of ability to be a pianist. I think AP Wimmer was disappointed, but man, that was so hilarious and scary! Sister Price was asked to do it instead. She did amazing! Okay, now the good stuff. President Carlson and Sister Carlson are the best! They work so differently that the Cleveland's but it's awesome to watch them work as a team. It's never from just one of them, when one speaks it's from them both. I love it! They talked about how things will be changing somewhat. We are focusing on the people of Indiana especially! President Carlson is motivated by the conversion of the missionaries. If we are changed, we can help others change! I love that and I am so grateful for the changes I've experienced. I love the gospel so much! This weekend has been incredibly rainy! Just running from our car to the church we got drenched! We got dropped, kind of, by Matt. He told us via text, that everything we taught him was great and he believes it, but he wasn't going to further his lessons. We think he was nervous about how strongly he felt the spirit. He definitely felt the spirit and it may have scared him off. We will see him on campus and he will come around to the idea again! I love the gospel! It's amazing to see Heavenly Father's hand in our lives!! Look for those tender mercies! So this week has been a busy one. We have had a full day every day of the week. However, it's not the same "full" you might think of for a missionary. We've taken it with a lot of humor though! Here's a quick list of the activities of the week! 1. Welcome to back to church, Michael!! (a less active member) We've been working with Michael! He is a really smart, spiritual guy, but he struggles with some aspects of the church. He has issues with depression and is constantly switching medication to try to find a solution. We invite him to come back to church every week and usually get "I'll try". Well this week was our miracle! He came to church! And he stayed for all three hours! Now we know it's not just coming to church that shows change, it is the fact that he enjoyed it and participated! 2. "Do not go in your apartment" - Elder Kidd concerning the high possibility of radon gases in our apartment On Monday we had a conversation with Elder Anderson, the housing guy. We told him we were feeling off and explained the symptoms we've been having. He said we need to get a Radon Gas test ASAP. We got it of course. We talked with our district leader, Elder Kidd, and he did some research and sent us a text saying "Do not go in your apartment." It was hilarious because he has been willing to switch apartments with us so we can have a better living situation. We have yet to take him up of the offer. 3. 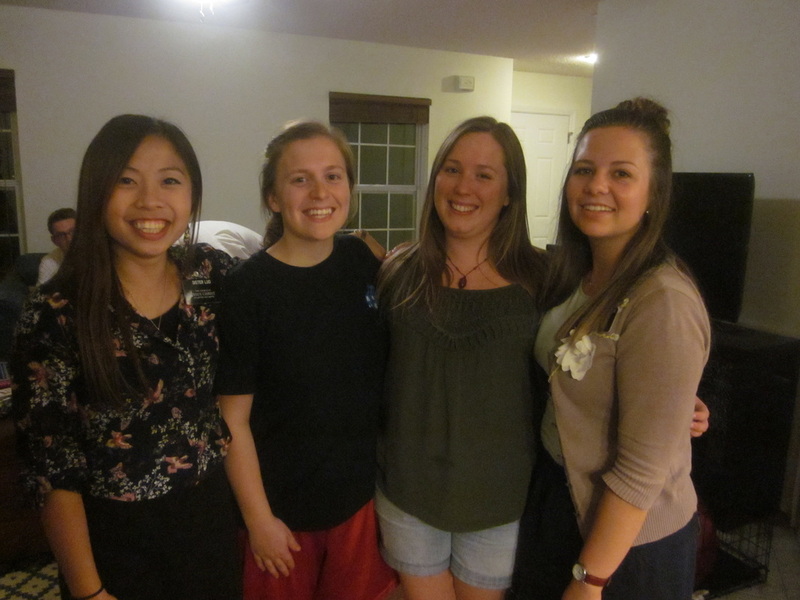 Four sisters, one apartment, a little contention and a lot of compromising. Following our message from Elder Kidd, we received a call from President Carlson saying we needed to sleep elsewhere so he didn't find us dead in our apartment from poisoning. We made quick arrangements to sleep at the sisters apartment. They have two bathrooms and two bedrooms. We thought it would be a good set up for the night and next morning. Little did we know, three of us would share one bathroom and the fourth person would get the other bathroom. It was a great morning! Lots of learning how to handle lots for roommates sharing! 4. Greek pasta is a wonderful, refreshing invention. Jessica, the sister of a member family who feeds us often, offered to have us over for dinner! Well, it turned out to be lunch because of her work schedule. We went over and had Greek Pasta (fettuccine, Parmesan cheese, lemon pepper and lemon juice). She is so sweet and we were able to have a great conversation with her about her past and how she is starting the journey back to Christ. I love seeing the full picture of people's lives and seeing where they come from. 5. Big hair Matt brought some big brain questions! Let me just say, for only having one investigator to teach right now, Matt is great. He responded to our messages and asked if there was anything he needed to do to prepare for our meeting. He watched the video we asked him to and he saw a lot of parallels with his beliefs and what was discussed/shown in the video! We invited him to read the Book of Mormon and he said yes! Pray that he will not let his intelligence get in the way of feeling the spirit!! With everything going on, I've learned so much! I can do hard things and I can be happy in whatever circumstances! Life is still good! I've learned a lot about Charity and how when we develop this Christlike Attribute, we are able to become more purified in the Savior. Charity truly is the greatest of the attributes of Christ. It requires humility, patience, and so many other qualities! But the best part is we have the opportunity each day to work on them. The Savior never gives up on us! I know the Savior lives and he is forever by my side. I have received much strength this week through the Atonement. I know I am a daughter of a loving Heavenly Father. Never doubt your worth and significance to Him. Hah it's an ongoing saga of the apartment issue. So on Monday we got the radon gas test for our apartment and started it. We told our district leader, Elder Kidd, about it as soon as we found out and he emailed President Carlson to tell him. I think he knows we are a little too prideful to complain to President. Anyway, President read the email and called us shortly after. We talked to him and he insisted that we move out of that apartment until they can find a solution to the issue. It's crazy. We are living day to day in this area. We've had to neglect our area and it feels like we aren't missionaries right now. But it's okay. There is a reason we are struggling and experiencing so much opposition. There must be some miracles headed our way. One thing I've learned is how much I love President Carlson. He is so sweet and inspired. He cares so much and knows when we aren't doing well even though we aren't speaking with him on a daily basis! Man, the spirit is so amazing! So we are staying with the Strong's as of right now. We aren't sure what the long term plan is. Our housing coordinator is on a different page than President Carlson is, I think. So he said we can move back in today, but President doesn't want us in there until it's for sure safe. He said "I don't want to wake up one morning to find you dead." or something to that affect. So we are figuring out what the best solution is. We have a pretty good set up in the Strong's apartment. They are like parents to us, so they treat us well and have given us their spare bedroom to live in. Sister Porter and I are close so it's not a big deal. We don't really need "alone time". They are also going out of town this weekend so we will have the apartment to ourselves. We are just trying to find the easiest solution to avoid inconveniencing anyone. It's been a whirlwind of things to do, but it's okay. We are hoping President will leave us together next transfer so we can actually work together. I've learned a lot this week. I know I was in a place of stagnation, so God gave me room to grow, but man, it's been tough. One thing I really learned to appreciate more this week is Priesthood blessings. I don't understand the priesthood very well, but I am so grateful for the power of God here on earth. Our district leader is so sweet and concerned for our well being. We would probably still be in our apartment if it weren't for him. Anyway, he asked us one morning after work outs if we wanted blessings. We talked about it a lot and realized we'd both been contemplating it throughout the week. This has been taxing on us in a lot of ways, emotionally, spiritually, physically. We decided we would get blessings. It was so cool to see how the blessings, from the same elder, were so different. I have yet to listen to mine again, but I just love the priesthood. It's so great! "Y'all are high on fungus drugs"
- "We are not physical beings having a spiritual experience. We are spiritual beings having a physical experience." --> Okay, I love this one too! This life is for us to experience things with a physical body, but we need to not neglect our spiritual experiences. They are so important in our growth! It is about our spirits. That is the core of us. - "We go to school to learn how to learn." --> For all those students returning to classes this Fall! Learn how to learn. That is what gets you jobs in the future. If you know how to learn things, you will be a much more profitable employee. But likewise, this life is a time for us to prepare to meet God. We will forever be progressing when we live with Him in the Celestial kingdom. Therefore, we need to learn how to learn so we can continue learning after this life! - "Marriage is a learning experience. Parenthood is the training field to become Gods and Goddesses." --> I guess learning is important. Nuff Said. We were on exchanges with the Clear Creek sisters. It took me back to the Terre Haute days of sharing a car with the elders! We walked everywhere! It was exhausting but worth it! We were in this trailer park and we walked past this trailer with a dog on a chain. We walked past as it kept barking at us. The woman of the house came out to see why he was barking. She told us he is nice. He is 9 months old, but a pretty big dog! We walked over to pet him and he started jumping all over us! We finally got him calmed down a little and behind the fence she has, where he tried to jump over the fence. Well, we taught an amazing lesson and they said we could come back! At the very end, after we prayed, Sister Ben asked them, casually, yet awkwardly, if they had a paper towel. They said no and asked why she needed one. She told them that their dog had tracked poop all over her legs and shoes while he jumped on us. (I didn't get any poop on me) That's not all... When they brought a rag out, she started wiping her leg off. The woman's husband (super nice Christian guy) took the rag from her and crouched down to clean it off her shoes. The awkward level skyrocketed!!! It was hilarious in all ways possible! ...it was so gross though. My watch has smelled like dog breath since then from his slobber! So this week we discovered that our apartment is nearly deadly. Our A/C doesn't work well so it's 75 degrees all the time. Which I know is nothing in comparison to some other missions, but it's not just hot air going around. The air ducts have a couple inches of standing water in them that send out mildew-y, moldy air! It's so great! We noticed we have both been lethargic and ill feeling. But we thought it might just be from the heat or the new transfer. Anyway, we realized we felt much better when we spent more time out of our apartment. Still haven't figured out how to fix it, but whatever. Se la vie. Elder Ellsworth said "Y'all are high on fungus drugs" one night when we were talking to them and losing our minds in laughter. That is the week in a nut shell! We went to the temple today! It was so great! Lots of miracles and we got to see Michelle, from Columbus! It was her first time to the temple! Such a sweet experience! 1. Exchanges with Sister Ben! With the changes on Tuesday, my life is so different! I currently live in Bloomington, Indiana! We serve on the campus of Indiana University. So it's a bunch of young people going to school and working! So strange, but really awesome! It reminds me of my training in Terre Haute when we would come to IU to do exchanges with the Sister Training Leaders! I am serving with Sister Porter. She was in Columbus when I was in Greenwood, so we got to go on an exchange!! 1. We don't knock on doors, but instead we contact people by walking around campus and taling to them! We usually ask them get to know you questions, then either invite them to church, or teach them. It's sweet. Way more natural than knocking on doors! 2. Mondays are busier than Saturdays, so our preparation day in now on Saturday! Hence the email! We aren't working with any investigators right now because they are all out of town for the summer... hopefully that will change in the Fall! We are, however, working with some less active members. One of them is Alexa. She is less active in church because of social anxiety (the crowd). She came to institute and we met her there. She is so sweet and really converted to the gospel. We are working with her to feel more comfortable a church by turning on the speakers in the foyer for her to sit out there to listen! Pray that it works this week! Last night we invited our neighbor, Wil, to play volleyball at the church. We went before him, thinking he wouldn't come but he showed up like 20 minutes after us. It was sweet! We had a good time. Campus life is so different, but it's great! The work moves so differently. Now we know our neighbor and he is our bud! In regards to the biggest change of all... I am really sad to be gone from Sister Williams. We had a really great run, but everyone's time runs out eventually. It was a hard last night in Columbus. We stayed up way too late packing me up, but it was worth it. Its amazing all the things to learn from just one person. I am so grateful to have such a wonderful friend. NOW I get to make a million more young friends! Life is good and God puts us where He needs us to be, when He needs us there.